Jessica is from Sheboygan, Wisconsin and graduated from South High School in Sheboygan. 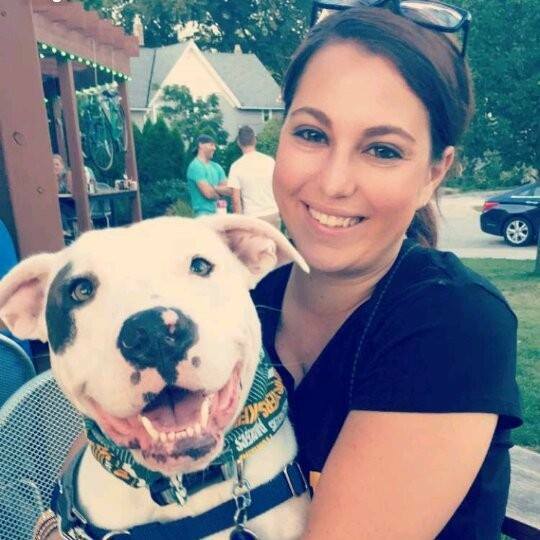 Jessica also attended Globe University for college in Green Bay for her degree in Veterinary Technology and is a state certified veterinary technician. Jessica lives in Sheboygan with her husband, Joe and their adorable son William. They have a cute pittbull named Saleen, and a fabulous Bengal kitty named Vera. Shana is from Two Rivers and graduated from Mishicot High School in 2002. After spending some time here she moved to Milwaukee and started a true passion in working with dogs. She started out working in a doggie daycare enviroment and became involved in dog rescues, specifically pit bull rescue. She has fostered and found homes for over 30 dogs in the 10 years she was there. Shana recently found her way back to the area where she wanted to continue to work with animals. She started out working in the back kennels taking care of any boarding clients that came in and more recently has been helping in reception. She has enjoyed getting to know clients and their favorite companions. She also has begun her recertification process to become a certified pet dog trainer and has been back working in the force free dog training field for the past couple months. Shana currently has 2 dogs, a rescued pit bull/ bull terrier mix named Hawkeye and a rescued dachshund mix named Ruxin. She also loves her pocket pets and currently has a guinea pig and 3 rats. Meg Hebert, Groomer Meg Hebert brings 30 years of grooming experience to Mishicot Veterinary Clinic - the majority of it spent wonderfully here! Meg grew up in Manitowoc with all kinds of animals in her life (horses, rats, snakes, turtles, frogs, fish, dogs, cats and rabbits). Her love for Golden Retrievers, which she raised and showed, got her into grooming. Her grooming skills began at Kandamor Kennels before moving to Minneapolis in 1983 to learn finishing work at Valentine's Pet Salon where she worked for 5 years. In 1984, Meg bought her first Standard Schnauzer and fell in love! She raised and showed Schnauzers until 2002. In 1988, she moved to California and worked for a well known grooming salon in San Diego. 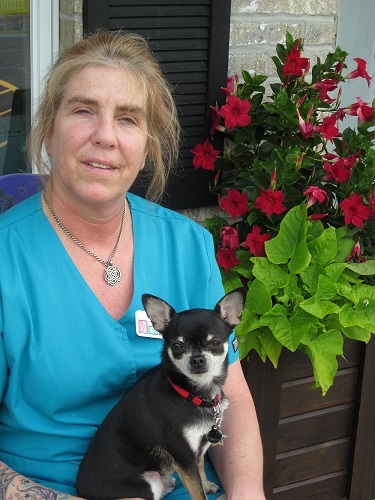 In 1994, Meg came back home and began working at Mishicot Veterinary Clinic so that she could continue to bring her love to dogs and their owners. She has two lovely dogs that keep her busy when she is not at work making all the dogs pretty!